When fall rolls around, there is plenty of harvest fun to be had here in Georgia! Sleuths are invited to wind their way through some of the best corn mazes in Central Georgia. See our picks for the coolest and most creative corn mazes around. Make the most of the fall season by getting lost in these exciting and fun corn mazes today! Most of the year, Daisy Adams operates as a normal, 55-acre family farm located 45 minutes from Macon in Cochran, Georgia that grows strawberries, pumpkins, and other forms of fresh produce. In the fall, though, it becomes a destination: other families begin to flock to the Cochran property to celebrate the season. During September and October, Daisy Adams Farm offers a full lineup of fall fun, including an annual four-acre corn maze. The farm also invites guests to hop on one of its hay rides, browse its pumpkin patch, and even interact with its animals. Beginning September 29th, you can stroll in this year's maze that is dedicated to the Children’s Hospital of Navicent Health in Macon. At the end of October, a portion of the proceeds from maze goers will be donated to the Children’s Hospital.Also part of the interactive experience is our Selfie Scavenger Hunt. Grab our camera and put yourself in the fun. Hamlin Hills Farm is known for hosting several seasonal events all year long. The fall cools down with corn mazes and zombie paintball. The Amazing Corn Maze of Hamlin Hills Farm is delightful during the day and Haunted at Night by the demented and disfigured pilot who crashed there 40 year ago. Fear will overcome you with our frightening scenes in our terrifying walk through corn maze. 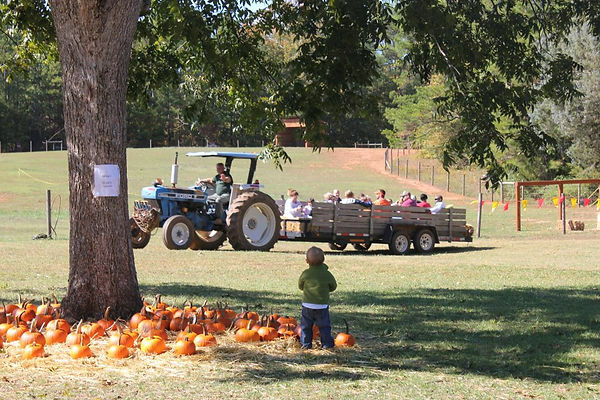 Twin Oaks Fun Farm in Forsyth, Georgia has fall fun for the whole family! This fall they have Fall Family Fun days with hay rides and a pumpkin patch. Additionally, there is friendly farm animals, a bee hive exhibit, a corn crib, and a large playscape. TroupCorn was created in August 2009 as a business venture into the Agritourism Industry. This is not their first venture into agriculture, though. TroupCorn also manages a production farming operation. The production farming operation is cotton, corn, peanuts, small grains, soybeans & produce. TroupCorn's goal for visitors is to provide education and entertainment in a rural farm setting, as well as, fun affordable family entertainment.